AS an avid knitter, I know how easy to collect skeins of yarn and accessories. I am always on the lookout for my yarn needles ! But once I got organized, I found more time to do the things that I loved most-knitting. I wish that I could tell you, here is the one system that is right for you. But in fact, there is no one right system. The only system that works is the one that is right for the amount of yarn, books and needles that you have. And it must fit into the space that you have for it. It may take some experimentation to figure out the right system for you. Another consideration is how you will organize your stuff, once you get the system that is right for you. 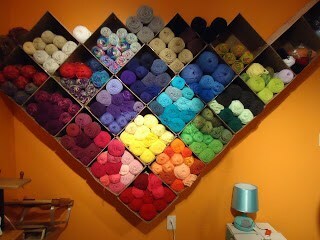 If you only deal with one type of wool, then you can just store by color. Another type of storage idea is to store by manufacturer. 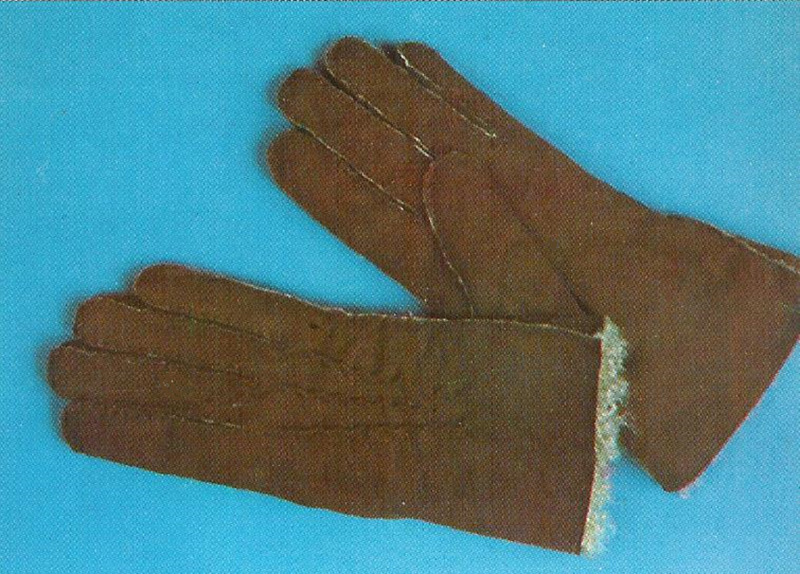 You could also store them by type of wool. Once you figure it all out, you will be able to take credit for a job well done. If you are storing your yarn as balls, safety pin the wrapper with all the information on the ball. That way you can always refer to it if you need to. If you tend to knit in the living room as I do, get an ottoman with a lid, It is perfect for storing project you are working on as well as other yarn. Label the container with the skein information. 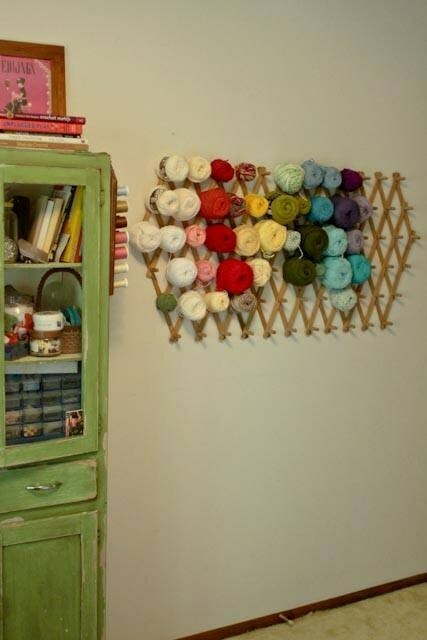 Use wooden clothes pins to store bits of yarn. Wrap the yarn around the clothes pin. Write the name of the yarn on the end of the pin. Store them in a basket or a box. Take a clean 2 liter soda bottle.Use a hook to pull one end of the yarn out of the top. Decide what works for you. Sort by color, by yarn weight, by fiber type, or by brand. Select your storage type and get your yarn sorted and stored. Decoupage enthusiast Amy Anderson uses fabric to cover a wood storage box for keeping yarn. She coordinates the cute pear fabric with acrylic paint on the borders and top. Learn how to create a gorgeous diamond display and storage for your yarn with corrugated plastic inspired by the Lion Brand Yarn Studio! 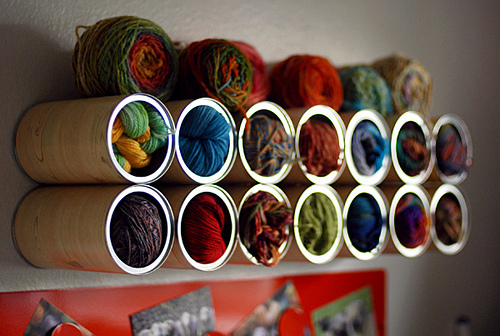 This DIY Yarn Storage is inexpensive to create and displays your yarn so beautifully! 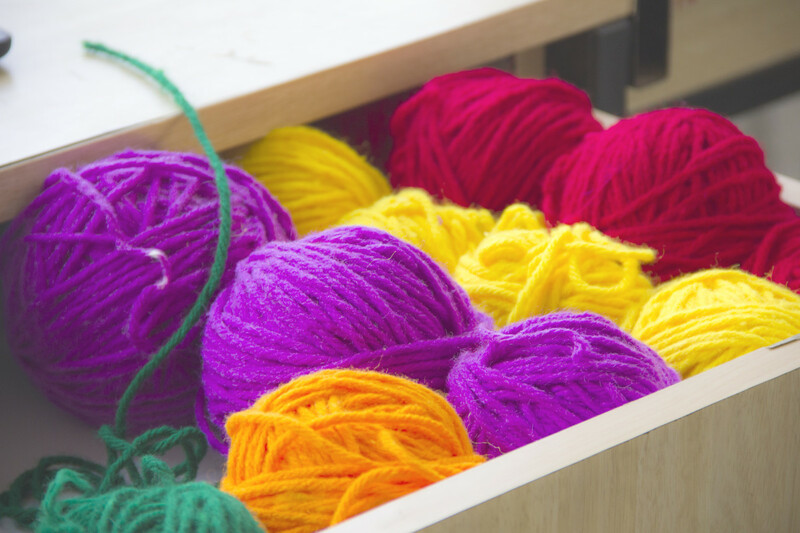 This quick and easy DIY solution for tangle free yarn storage is a life saver. Keep your skeins of yarn unraveling with the DIY Skein savers. 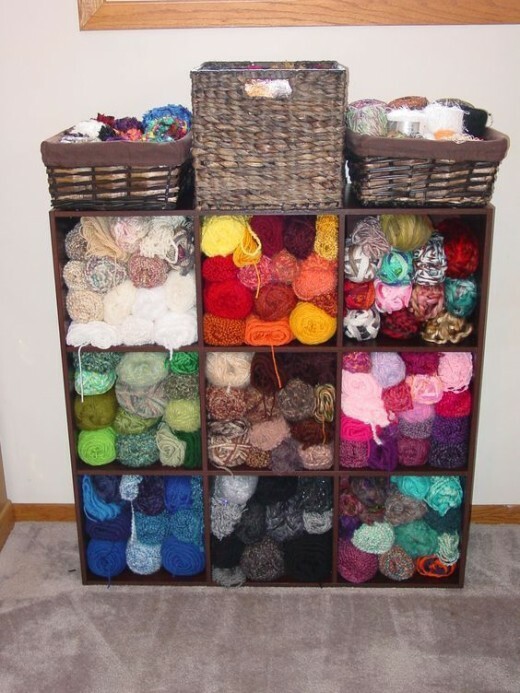 Sort through your knitting needles. Take pairs of needles and attach them together with rubber bands.decide on a storage system and get them stored. Let's face it, if you are like me, you have sets of knitting needles that could be considered either hoarding or collecting, depending on how you look at it. Once you decide on one of these storage solutions, I promise that you will always have your pairs of knitting needles when you need them. There are plenty of things that you can find at your local dollar store to help you with your knitting storage. Thinking outside of the box will help you get the storage tools that you need and stay within your budget. Portion pack bags are perfect to hold all kinds of knitting accessories, If you do not have a label maker, you can also find labels at your dollar store. Over the chair storage-If you are limited in the area that you have to store your knitting supplies, this might be the product for you. It has a pocket system and slips over the back of your chair. 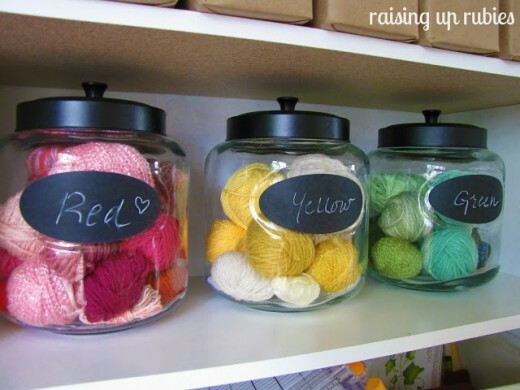 These are brilliant ideas to store the knitting yarns and they look so organised and beautiful too. Would love to keep mine in the manner, you have suggested. 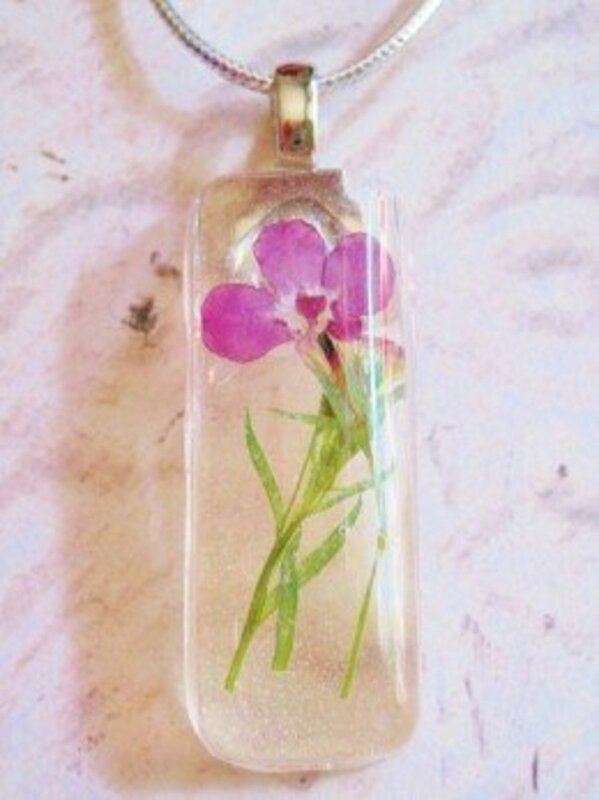 Thanks for sharing your wonderful idea with pictures.